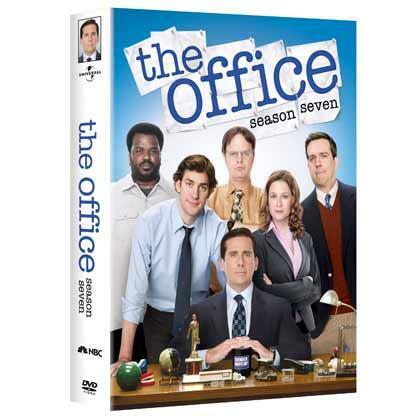 TV on DVD: "The Office: Season Seven"
The strength of The Office’s season seven is how the rest of the cast stepped up, making Carrell’s exit with four episodes remaining just little bit easier to swallow. With the announcement of Steve Carrell’s departure from The Office to take place during the show’s seventh season, many wrote the comedy off as done. What could the series do without the man the show was built around? For those people, plus the cranks who considered The Office past its prime, the only dignified thing to do would be to end the show once Carrell’s Michael Scott left the company. However, in rewatching the episodes of this past season, I was reminded at how strong of a season it was. In addition to the fine, uncomfortable humor The Office has become famous for pulling off, there was a great deal of sentiment around as Carrell’s last days approached and the romance between Michael and Holly (the wonderful Amy Ryan) was played to great effect. But the strength of season seven is actually how the rest of the cast stepped up, making Carrell’s exit with four episodes remaining just little bit easier to swallow. This isn’t like Cheers or MASH, in which supporting characters rotated throughout the show. Sam and Hawkeye were there until the last fade out. I believe that the producers of The Office definitely have the tools to reboot the show and I feel that they must stick to their tried and true formula: the inept boss leaning on the people in the office who are smarter than him. Thus, the most sensible action the producers should take come season 8 is to place Ed Helms’ Andy in the front office, allowing Jim to remain one of Dunder-Mifflin’s top salesmen. It feels as if the writers were heading in that direction, what with the unrequited romance they used as an ongoing story throughout season seven. Andy’s love for Erin (Ellie Kemper ) was well documented and Helms is hilarious as he tries to woo her back. But she’s involved with the somewhat psychotic Gabe (Zach Woods). When he’s sent away in the season finale, it looks like the door is wide open for Andy. Wouldn’t it be great if Andy realizes that he still loves Erin, but he refuses to do anything about it, or he can’t, because of Dunder Mifflin policies? Imagine the resentment that would grow between Dwight (Rainn Wilson) and Andy, especially since Dwight blew his chance as office manager when he fired a gun in the office? Meanwhile, the dynamics between the rest of the characters could basically remain intact, with most of them carrying on their regular lives while Andy, Jim (John Krasinski) and Pam (Jenna Fischer) carry the bulk of the stories (along with newly appointed weirdo, James Spader). I’m speaking hypothetically, of course, but I honestly feel that the clues are there in season seven that point to this direction of the show. One need only watch the last episodes of the season top see how the rhythm of the show was off. Will Ferrell was a fun addition, but we all knew he wasn’t going to stick around. He’s freakin’ Will Ferrell! However the new situation in the office turns out (we’ll find out soon), the producers were wise to let Carrell leave early so that they could begin to find their footing. The Office will survive for at least a couple more seasons, at which time I’m sure more cast members will decide it’s time to leave. At that point, fans of the show will have the DVD’s to return to when ever they need a fix of Office humor. Like ABC’s Lost before it, The Office has always used the many types of media available to viewers to give fans more from the show. Whether it’s webisodes, extended episodes on DVD, deleted scenes or commentaries, The Office never chinces of the extras with the collections. Season Seven is no exception, as it’s filled with plenty of good stuff. In addition to the aforementioned goodness, Season Seven also included the complete version of “”, the film Michael Scott made over the years. In the episode in which it was shown to the audience, there were cutaways to character reactions and other subplots. The DVD extra pieces together the entire “movie.” It takes the level of ridiculousness The Office crew are capable of doing to a higher level.